leading to renewed calls by activists to end fluoridation. Most public water supplies in US still have the chemical added under the guise of preventing tooth decay. echoing the Environmental Protection Agency (EPA) saying there's substantial evidence of developmental neurotoxicity associated with the chemical. is not so much a matter of genetics, but of diet. is the best protection against tooth decay and bad orthodonture. Toward that end, we have never given Baby cane sugar, fruit juice, or processed foods at all. as well as Omega-3s—all crucial for healthy brain, teeth and bones. which, like many kid’s toothpastes, has no fluoride. She’s four now, and has beautiful, broadly spaced, strong teeth so far! Ever wonder why most kids’ toothpastes have no fluoride? Because kids inevitably will swallow some paste, and fluoride is extremely TOXIC. just like you do with bathroom cleaners and medicines. should not be swallowed into our food and water supply in the first place? the nuclear, aluminum, and phosphate (fertilizer) industries. The EPA has classified fluoride as a toxin. anesthetic, hypnotic, and psychiatric drugs, as well as nerve gas used by the military. and then rub it into our teeth and gums twice a day. Hmmmmm. especially when there are non-toxic alternatives that work just as well? from our drinking water or toothpaste might affect our teeth, but you needn’t be. that there are no proven, positive effects from the practice. None. No proof. osteoporosis and bone scarring, brain tumors, fluoroderma, and more. According to statistics from the World Health Organization, the tooth decay rates of countries which do not fluoridate their water supplies are just as low, or even lower, than those countries which do. in tooth decay rates noted in communities which ended water fluoridation. including most industrialized countries. Despite pressure from the dental industry, 99% of continental western Europe has rejected, banned, or stopped fluoridation due to environmental, health, legal, or ethical concerns. And yet, their children’s teeth are just as healthy as children’s teeth in the U.S! In fact, in many parts of Europe where traditional, whole food diets prevail, they are healthier. to babies or using it to make formula. DO NOT GIVE FLUORIDATED TAP WATER TO BABIES OR USE IT TO MAKE FORMULA! Protect yourself and your children by avoiding the consumption of fluoride. and how to reduce your exposure from the many unexpected sources of fluoride in your life. What really causes cavities? It’s not what you think! Can you cure a cavity without a filling? Yes! This is our family recipe for fluoride-free toothpaste. It helps remove stains, leaves a fresh feeling in the mouth, helps relieve sensitive teeth, and saves money. Grind sea salt in a small coffee grinder, if needed, to make as powdery as possible. Mix all ingredients except the coconut oil to taste. You can stop at this stage and use this as a tooth powder if you wish. Mix in a teaspoon of coconut oil at a time until you find the right consistency for your paste. Put into a small, sealable jar or squeezable container. expertly sums up how and why to avoid fluoride wherever you can. 1. 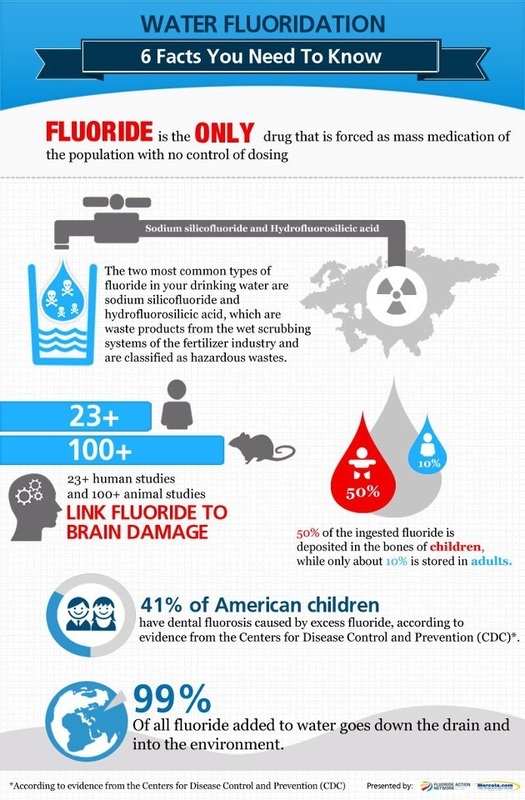 What can I do about fluoride in my water?
" If you stop taking fluoride, your body will get rid of it eventually. The fluoride that gets stuck in your bones gets stuck there for life pretty much, but that is not necessarily bad. Where fluoride has adverse effects is in the soft tissues. If you take over 200 mg of vitamin C per day that is all you really need for removing fluoride. In three to six months you should have about 99% of it out which is good enough." you will still be exposed to fluoridated drinking water. This is because once fluoride is added en masse to water it winds in almost all processed beverages and foods. 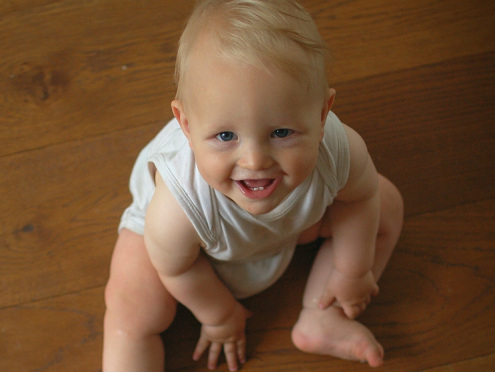 and many other processed foods, including infant foods, now have elevated fluoride levels." 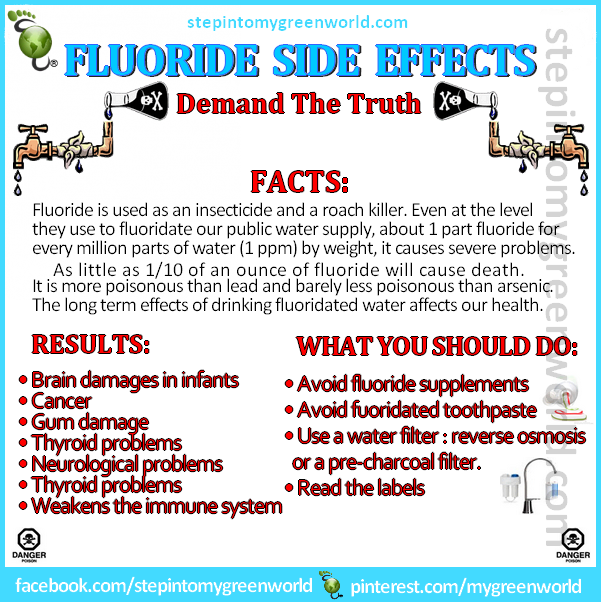 "Due its toxicity, fluoride is used in some pesticides to kill insects and other pests. 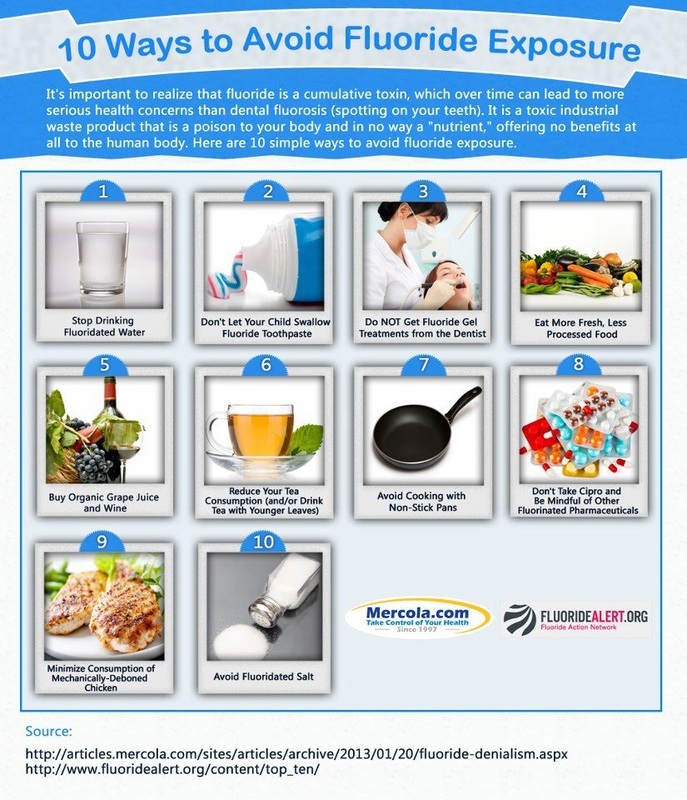 dried beans, cocoa powder, and walnuts–have high levels of fluoride. " "Tea plants absorb fluoride from the soil. As a result, tea leaves–particularly old tea leaves–contain high levels of fluoride. Brewed black tea averages about 3 to 4 parts ppm fluoride, while commercial iced tea drinks contain between 1 and 4 ppm. As a result of these elevated levels, numerous studies have linked excessive tea consumption to a bone disease (skeletal fluorosis) caused by too much fluoride intake." do break down into fluoride and can thus be a major source of fluoride exposure for some individuals." "Cooking food, or boiling water, in teflon pans may increase the fluoride content of food. In one study, it was found that boiling water in a teflon pan for just 15 minutes added an additional 2 ppm of fluoride to the water, thus bringing the final concentration to 3 ppm. " can make it seem like everything has elevated levels of fluoride. The good news, however, is that most fresh foods and fresh water contains very little fluoride."